Legal Worldbuilding: Really Stupid Laws | Worldbuilding Rules! 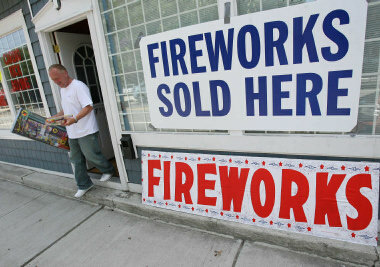 In a late night rush to pass a stack of legislation before the summer break, the Rhode Island General Assembly recently passed a law legalizing, for the first time in the state, the sale and use of certain kinds of fireworks. Since locals can already buy fireworks in nearby states, the GA’s intent was to keep RI dollars and sales tax revenues at home. 2. The type of firework that caused Rhode Island’s deadliest disaster since the 1938 hurricane, The Station nightclub fire, in which 100 people died and over 200 more were injured. It’s hardly exaggerating to say that every single person in this tiny state has some personal connection to that fire. And Rhode Islanders don’t need their already long memories to keep the Station fresh in mind; the legal repercussions are still winding along 7 years later. The uproar over the law, reported in the Providence Journal, lasted several days, until the state Fire Marshall stepped forward and defined what kinds of fireworks can be sold. It’s just this easy in the real world, for those in power to make bad laws, even with the best of intentions, and for those under their rule to overreact in numerous ways. Yes, even to good laws. Now imagine that someone with lawmaking power in your world has created a new law. What circumstances would make it a Really Stupid Law? What would make your world’s people overreact to the law? What power do they have to object to an RLS, or ignore it, or change it? Extra help: two phenomena are nearly always present in lawmaking. First, the more laws are made prohibiting or controlling a certain kind of behavior, the more certain you can be that the lawmakers are not having any luck stopping people from doing it! Second, lawmakers very often have only one set of (usually short term) intentions in mind in creating a specific law, and never foresee any other consequences that might backfire from the same law. If you need more inspiration, do a web search on “bad laws.” Just browsing the first 2 pages of hits will give you lots of ideas about how many ways people can see “bad laws.” Google also brings up related topics like “funny laws” “unjust laws” and even “bad inlaws” – which in some societies might be grounds for their own set of laws!